“Well, look, here’s the bottom line,” said Obama, “We’ve got a tough map. A lot of the states that are contested this time are states that I didn’t win. And so some of the candidates there, you know, it is difficult for them to have me in the state because the Republicans will use that to try to fan Republican turn-out. The bottom line is, though, these are all folks who vote with me. They have supported my agenda in Congress. They are on the right side of minimum wage. They are on the right side of fair pay. They are on the right side of rebuilding our infrastructure. They’re on the right side of early childhood education. If you were a Democrat candidate running for Congress, how would you feel about that statement? Is Washington Really Interested In Dealing With This Problem? The Daily Caller reported today that President Obama has appointed Ron Klain, as White House Ebola response coordinator. I don’t question the need to put someone in charge of handling the spread of Ebola in America, but I do wonder about the appointment of Ron Klain. Mr. Klain was one of the senior White House officials who advised that President Obama should visit solar power company Solyndra in 2011, despite an auditor raising red flags about the company’s finances. Mr. Klain has previously worked for Vice-President Al Gore as chief of staff and as Vice-President Joe Biden as chief of staff. Mr. Klain has no medical background. It seems that in keeping with the pattern that has developed in handling Ebola in America, the President has chosen someone to handle to political angles rather than the medical angles. I suspect that this choice means that the government will continue to make decisions that are politically expedient but do nothing to protect the lives of Americans from this deadly virus. Normally the ‘Style’ section of the newspaper is not a place where you expect to find anything that is actually important news, but yesterday the Washington Post placed a very interesting article there. This is NOT an unimportant article. To put this simply–the White House has been controlling the news about the President. Reporters have decided that they want to make their own decisions about how and what they report. The timing on this is very interesting. We are weeks away from a pivotal election–I don’t know if we can expect a Republican ‘wave’ election, but I expect the Republicans to do well in the mid-terms. President Obama’s approval ratings are low, and people will begin to question the accuracy of the media (as many already do) if they keep reporting on the President through rose-colored glasses. America is a Representative Republic. Our country relies on an informed electorate to preserve our Constitution and our freedom. It is the responsibility of the press to inform that electorate in an objective way. In recent years the press has forgotten how to do that. Maybe this current rebellion against White House control of the White House press corps is the beginning of positive change. The Washington Free Beacon is reporting today that as Russia begins moving tactical nuclear weapons into the Crimea, the Obama administration is funding non-official arms control talks with Russia through a Washington think-tank that are aimed at curbing U.S. tactical nuclear arms in Europe. First of all, I would like to remind everyone that Russia has paid no price for taking over the Crimea–there is no one standing up for the rights of the people in the Ukraine to expel the Russians from the Crimea and re-unite their country. The Russian takeover of the Crimea is considered part of the current baseline, and no one is talking about it as if it were the problem it is. This is another example of America’s lack of strength making the world less safe–not safer. We need to increase our defense spending to make sure we have the weapons in place if Russia decides to go after a country in Europe next. The American Thinker posted an article today about President Obama’s latest assurances that NATO would protect the Baltic states. The President has a habit of drawing red lines and then stepping over them. Unfortunately, we have passed the point where the rest of the world takes him seriously. The article reminds us that as soon as President Obama drew his red line in Syria, Putin made a move that left Russia as the dominant player in Syria. Now Putin is reacting to President Obama’s statement that NATO would protect the Baltic republics. The apparent abduction and detention of an Estonian security officer raised tensions between Estonia and Russia just two days after President Barack Obama came to the country and vowed to defend it as a NATO member. Estonia’s Internal Security Service, known as KAPO, said its officer Eston Kohver was “illegally detained” at gunpoint early Friday while on duty in southeastern Estonia. It said his abductors had come from Russia and had jammed radio communications and used a smoke grenade in the incident. We are in very dangerous territory now. Russia will be encouraged to escalate its provocations, having seen that Obama’s threats are empty. Putin as already mentioned that Russia is a nuclear power, a not so veiled threat to start World War Three should his future aggression meet a response. The risk is that having shown he can be bullied, Obama will respond too late and too strongly, thereby setting off Armageddon. Weakness is provocative. Obama believes the opposite, and he is as wrong as Neville Chamberlain was. The Hill posted an article today about President Obama’s decision to delay any executive order regarding immigration. First of all, it is not President Obama’s job to write an executive order regarding immigration–that responsibility belongs to Congress. Latino groups on Saturday promised they would “not soon forget” President Obama’s move to delay any executive action on the border crisis until after the midterm elections. Loosely translated this means that if the President unilaterally passed amnesty for illegal immigrants, the Democrats would seriously lose the midterm elections. While a number of Democrats facing reelection pressured Obama to delay action after he vowed on Friday to move on immigration “soon,” a leading Democrat, Rep. Luis Gutierrez (Ill.) has urged the president to “lean in” on reform. Gutierrez scolded his colleagues earlier this week, telling them to “stand aside” and let Obama take action. Gutierrez is scheduled to hold a press conference in Chicago on Monday with immigrant families that will be impacted by the administration’s decisions on immigration and deportations, an advisory states. Our immigration system needs reform, but more than that, our borders need to be secure. Anyone can enter America through our porous borders. (In August I posted a picture at rightwinggranny of James O’Keefe crossing our southern border dressed as Osama Bin Laden.) What kind of a terrorist attack do we have to have in America before we pay attention to border security? Yesterday John Hinderaker at Power Line posted a story about a recent speech by President Obama. What are immigration rights? Is it the right to immigrate to the United States legally? If so, I support those rights. If it is the right to immigrate to the United States illegally, I would like to know where that right comes from. It certainly is not listed in the Constitution. It has been understood throughout history that a country has a right to police its borders. There is nothing hostile about enforcing borders. Not enforcing our borders increases the burden on our schools, communities, and government services. It is time to enforce our current immigration laws. If the voters decide they would like those laws changed, they can vote for representatives who will change them. It is reckless not to enforce our current laws. We are leaving ourselves vulnerable to disease, terrorism, and crime. There is a reason the border is there. Yesterday John Podhoretz posted an article at the New York Post about some recent comments by Hillary Clinton. Hillary has made some very interesting comments about President Obama’s foreign policy–an interesting point of attack since she was Secretary of State for much of his tenure. Mr. Podhoretz writes that he thinks President Obama miscalculated by not choosing Hillary as his Vice-President. If she were Vice-President, she would still be standing with him–not trashing his foreign policy. What’s more, when she was working for you, you refused to give her the reins of US foreign policy and centralized all the power in the White House. Fair is fair. You took Michael Corleone’s advice: You sought to keep this enemy close. But you didn’t keep her close enough. And now you shall pay. She has made you start paying already. Hillary Clinton is the most popular politician in America now — more popular than you, if you haven’t noticed. And she has decided, for all intents and purposes, to go into opposition. That was the meaning of the extraordinary interview she granted Jeffrey Goldberg of The Atlantic over the weekend. It was the annunciation of her separation from you and your legacy. Though filled with qualifications and words of praise for Obama here and there, the interview is a rare assault against a sitting president by his former secretary of state. Mrs. Clinton’s political judgment is not to be trusted. She allowed Obama to eat her lunch in 2008 in part because she was overconfident and tacked too far to the center too early. She may well be doing it again. But she has made her choice. If Obama stumbles, she’ll be there — with her ankle turned out, to trip him up still further and then, with a sad smile, claim credit for having known that the obstacle had been there in his path all along. I believe Hillary will again be challenged from the left for the Democrat nomination for President. I believe that challenge will come from Massachusetts’ own Elizabeth Warren. It may be an interesting primary season. Recent events in Iraq show that – in our time, as throughout history – unless both sides in a war agree to stop fighting, the conflict will continue. Such fighting generally comes at the expense of the interests or security of the party that calls it quits. The mayhem in Iraq that has flowed from President Obama’s decision to “end the war” there unilaterally has reached the point where he felt compelled yesterday to authorize renewed U.S. airstrikes. The trouble is that his delusional approach to ending wars is of a piece with his tendency to micromanage, limit and, thereby, make ineffectual the military operations he does approve. I hope we don’t have to put actual boots on the ground again in Iraq, but it breaks my heart to see the gains we made with the surge thrown away. I truly believe that had we left forces there, there would have been enough pressure on Prime Minister Maliki to create a more inclusive government. Now we are faced with a radical caliphate in the Middle East that will grow to include some of the countries that in the past have supported us. Being an ally of America doesn’t mean much right now, and our abandonment of the Iraqis is an illustration of that. Hopefully air power will be enough to stop the slaughter of the innocent Christians that is currently taking place. Welcome to IGnet serving as a portal to the Federal Inspector General Community whose primary responsibilities, to the American public, are to detect and prevent fraud, waste, abuse, and violations of law and to promote economy, efficiency and effectiveness in the operations of the Federal Government. The Inspector General Act of 1978, as amended, establishes the responsibilities and duties of an IG. The IG Act has been amended to increase the number of agencies with statutory IGs. In 1988 came the establishment of IGs in smaller, independent agencies and there are now 72 statutory IGs. IGnet also serves as the purveyor of information, to the American public, from The Council of the Inspectors General on Integrity and Efficiency (CIGIE). “The Inspector General Act of 1978 as amended by the IG Reform Act of 2008” created the CIGIE combining what were formerly known as the “PCIE” (President’s Council on Integrity and Efficiency) and the “ECIE” (Executive Council on Integrity and Efficiency). The CIGIE has 7 committees, Audit, Information Technology, Inspection and Evaluation, Investigations, Integrity, Legislation and Professional Development as well as several related organizations. The job of the IG is to keep our government honest. Dozens of government watchdogs are sounding the alarm that the Obama administration is stonewalling them, in what is being described as an unprecedented challenge to the agencies they’re supposed to oversee. The inspectors general are now appealing to Congress to help them do their jobs uncovering waste, fraud, and mismanagement. “Agency actions that limit, condition, or delay access thus have profoundly negative consequences for our work: they make us less effective, encourage other agencies to take similar actions in the future, and erode the morale of the dedicated professionals that make up our staffs,” they wrote. This stonewalling of the work of the IG’s is unprecedented. Unless Congress acts quickly, the actions of this administration will damage our representative republic irreparably. In three months voters in America will go to the polls. You may love your Congressman, but if he is running interference for a corrupt administration, he needs to be voted out of office. Your freedom depends on it. Please vote carefully. Guy Benson posted an article at Townhall.com today about what is happening to health insurance premiums in Florida due to ObamaCare. Well, it just hasn’t worked out that way. There will be an average health insurance rate increase of 13.2 percent for Floridians who buy healthcare insurance on the individual market next year. Those who supported ObamaCare also told us that ObamaCare would bend the ‘cost curve’ of overall health spending downward. That hasn’t happened either. The projected ten-year cost of ObamaCare has nearly doubled from its original estimated cost. It has followed the path of other government programs over the years–cost more, solve fewer problems. To add to the mess, the Washington Examiner posted a story yesterday about a government healthcare program started in California as part of the economic stimulus package. “We need to bundle payments so you aren’t paid for every single treatment you offer a patient with a chronic condition like diabetes, but instead paid well for how you treat the overall disease,” Obama told the crowd of physicians. Obama was articulating what would become one of the key payment reforms in his health care law — a proposal aimed at giving incentives to providers to control costs by rewarding them for providing less expensive care. But a study published in the journal Health Affairs looked at an ambitious three-year pilot program of bundled payments in California that was funded by a $2.9 million grant from Obama’s 2009 economic stimulus package — and found that the program was such a massive failure, it could hardly get off the ground. Can we please get the government out of our healthcare and let the people who actually know something about it run it? David Limbaugh posted an article today at Townhall.com about President Obama’s continuing claim that the Republicans want to impeach him. Speaker of the House John Boehner has clearly stated that he is not interested in impeaching President Obama, so what is this about? A large part of it is about fund raising for the Democrat party. The Democrats’ congressional campaign arm pulled in $2.1 million in online donations over the weekend — the best four-day haul of the current election cycle — largely propelled by fundraising pitches tied to speculation that House Republicans could pursue the impeachment of President Obama. That’s part of the story. Another part of the story involves the blatant flaunting of unconstitutional actions in an attempt to goad the Republicans into impeachment. Why impeachment? Because it energizes the far left of the Democrat party base. So he is not only ratcheting up his rhetoric to accuse Republicans of a plot to impeach him, though House Speaker John Boehner has clearly indicated that is not in the cards, but also trying to force their hand into actually impeaching him. To this end, he is planning on upping the ante by issuing a far-reaching unilateral order granting amnesty to millions. That’s right. The leader of the Free World is trying to provoke Republicans into impeaching him or otherwise stirring a constitutional crisis. This is stunningly unprecedented. But more and more people are wising up to his serial abuses of power and his partisan agitation. I don’t have a great track record as a prognosticator of elections, but I am strongly sensing his party, as a direct result of his policies and lawlessness and its shameless refusal to rein him in, is going to get a titanic comeuppance in November. America is either going to be a representative republic or a banana republic. Voters in November will make that choice. On Tuesday, Caroline Glick posted an article in the Jerusalem Post about the war between Israel and Hamas. She relates the story of a phone call from President Obama to Prime Minister Binyamin Netanyahu on Sunday night during an Israeli security cabinet meeting. The request from President Obama did not take into account what would happen if that cease-fire went into effect–Israel would again be defending itself against never ending rocket attacks on civilians and a rebuilding of tunnels that were destroyed. A cease-fire without the destruction of Hamas is an invitation to another war a few years down the road. It will be amazing if we have any allies left by the end of the Obama Administration. One of the recent ideas to come out of the White House is that Republicans want to impeach President Obama. Admittedly, Sarah Palin has made that statement, but the silence from other Republicans is deafening. There’s a reason for that. 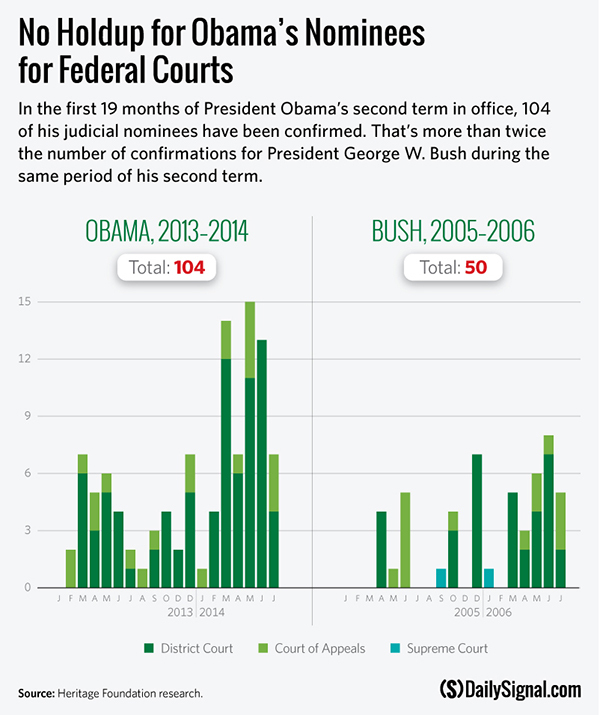 Yesterday John Hinderaker at Power Line posted an article with a picture that tells us everything we want to know about impeaching President Obama. 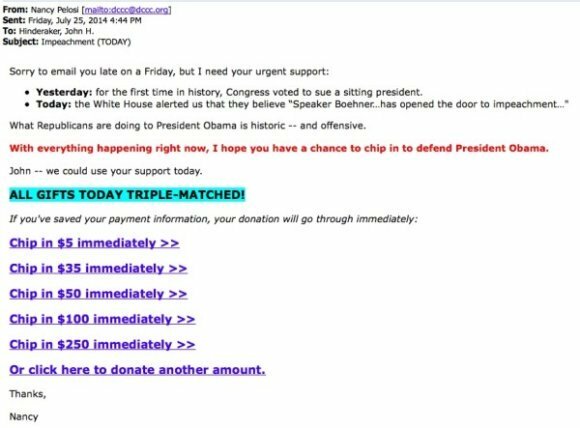 Impeachment talk makes great fundraising. It also distracts people from the domestic and foreign failures of President Obama. The biggest mistake the Republicans could make right now would be to attempt to impeach President Obama. Impeachment is probably the only way the Democrat party can be competitive in the mid-term elections. The Daily Signal posted an article today about President Obama’s latest Executive Order. The President claims that the order will bar federal contractors from practicing “discrimination” on the basis of sexual orientation and gender identity. That sounds good, but there are some problems with it. Today’s executive order does not contain any religious liberty protections—though it does retain an older federal regulation that permits religious organizations that favor employment of co-religionists to continue such practices. But there is no protection for organizations that hire based on mission—not on affiliation—to continue to do so. This in effect excludes taxpayers who hold conscientious beliefs about sexuality that run counter to Obama’s from being eligible for federal contracts funded with their own tax dollars. In response to this executive order, Congress has an opportunity to protect religious liberty and the rights of conscience. Policy should prohibit the government from discriminating against any individual or group, whether nonprofit or for-profit, based on their beliefs that marriage is the union of a man and woman or that sexual relations are reserved for marriage. The government should be prohibited from discriminating against such groups or individuals in tax policy, employment, licensing, accreditation, or contracting. The Marriage and Religious Freedom Act—sponsored by Rep. Raul Labrador, R-Idaho, in the House (H.R. 3133) with more than 100 co-sponsors of both parties and sponsored by Sen. Mike Lee, R – Utah, in the Senate (S. 1808) with 17 co-sponsors—would prevent the federal government from taking such adverse actions. Protecting religious liberty and the rights of conscience fosters a more diverse civil sphere. Indeed, tolerance is essential to promoting peaceful coexistence even amid disagreement. We have always had transgendered people with us. They should be treated with respect. However, people with religious convictions should also be treated with respect. The right of conscience has always been a part of American law–from abortion law to gender issues. The Executive Order President Obama signed today is an affront to the freedom of all Americans–it does not respect their First Amendment right to practice and live according to their religious beliefs. Someone needs to read the U.S. Constitution to all of the people in Washington .